Our initial meeting point was The Beeches. On arrival I was greated by our host for the next three day, Dave Craig. 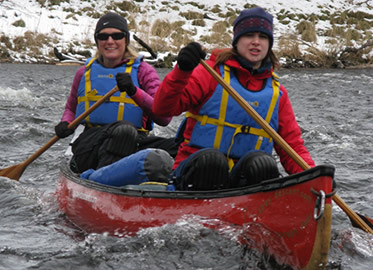 The Beeches is a family run retreat destination, specialising in open canoe trips, relaxation techniques and all round pampering. The grand victorian home is beautifully furnished and decorated and provided comfortable spacious rooms, welcoming roaring fires and out of this world cuisine. Dave’s wife Jude is a professional in the kitchen, providing the entire party with 5 star foodie delights in the evening. 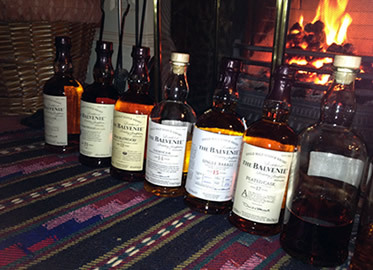 After dinner, when everyone was settled and exceptionally well fed we all gathered in the relaxation room and Dr Andrew Forrester (The Balvenie UK Brand Ambassador) conducted a very educational tasting session with a few well known Balvenie’s and also a few single cask bottlings. STOP THE PRESS… I must confess, I was absolutely petrified, at this point I had finally admitted to myself there was a strong liklihood that tomorrow morning was not going to go as planned and I would need to pull out. You see I have always had a huge fear of water. 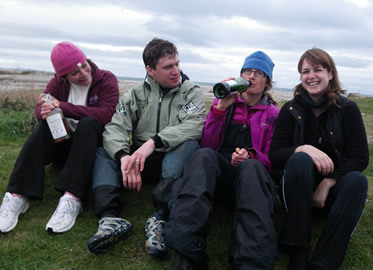 So while we were all enjoying the drams and swapping Whisky tales, I was aching inside worrying about the canoe trip. The next morning, after breakfast I came clean and admitted this was not for me and I couldn’t do it, BUT I never anticipated the magic of Dave’s wife Jude. Using her skills as a therapist, she calmed me, told me I COULD do it and then one small detail came out, “the Spey is not that deep in many places, in fact if you fall over you will be able to stand no problem“, wow that was it, that was the nugget of info I needed. The deal was sealed, thanks Jude you helped massively. 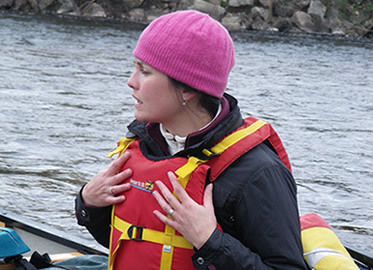 So the waterproofs went on and we were on our way to Knockando to launch our canoes into the River Spey. We finished our first day canoeing under the Telford Bridge at around 1pm and were picked up by a minibus and taken to the Craigellachie Hotel, after a quick change we were off to Glenfiddich for lunch and The Balvenie distillery for a tour, lead by Andrew. Never having been to either of these distillery’s I was looking forward to seeing how William Grant & Sons do it. Lunch was very welcoming, after a morning in the snow, on the river, in an open canoe for the first time, I was excitied to be offered some hot coffee and a bowl of soup, it was exactly what I needed to thaw me out. The coffee shop at Glenfiddich boasts a roaring open fire in modern surroundings and a delicious afternoon menu of light meals, soups and sandwiches. Onto the tour… The Balvenie Distillery boast to be one of the only Distillery’s is Scotland to make their whisky entirely on premises. They grow their own barley, they malt their own barley, they mash, they wash, they distil, they cask, and they mature ONLY on site. On our tour we were able to see every step of the process and Andrew ensured we had all the info. 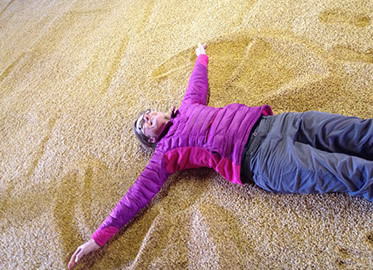 However there was a couple of occasions it felt like a primary school outing… I will blame our high spirits possibly from our VERY successful paddle on the Spey… but was there any need to demonstrate the “Angel’s Share” on the maltings floor or have a wee sook from Tun 1401. I am glad we all managed to refrain, haha, with Andrew keeping us three ladies in check. We finished off our tour by filling our own wee bottles from 1 of 3 casks used to create the Balvenie Signature – I selected a 1999 1st fill bourbon, in fact the three of us all selected from different casks! This tour was unique, to see traditional end to end production of Whisky with no break in the chain was fabulous. Dinner in the Craigellachie Hotel was delicious, with many traditional Scottish Fare on the menu. But the highlight at the hotel was the Whisky bar… what a sight. 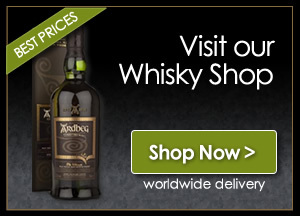 The selection was outstanding and was full of patrons who were serious about their drams. We were granted permission in bar to host our own Whisky Tasting and were able to rope in a few (VERY LUCKY) German tourists. 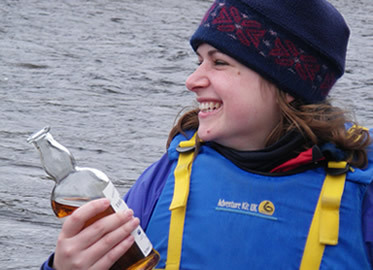 (Whom I introducted myself to as a Professional Canoeist) They must have thought it was Christmas, with exceptional Whisky thrust upon them for FREE, it certainly made for a lively Whisky panel. 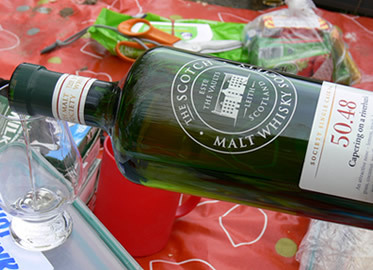 We tasted the SMWS 50.48 – Capering on the Riverbank and a delicious Balvenie Portwood and Balvenie Golden Cask. Stopping for lunch on the river bank was a highlight of the trip, with the cloth spreadout on the grass and the lunch pail emptied we all got stuck in, hot coffee, crackers, cheese, wraps, crisps… mmm exactly what we all needed, we also enjoyed a quick dram. Back on the River and just a few short hours later we had reached the sea, we were all exhausted but greatly satisfied of our tremendous achivement. After loading all the canoes on the trailer, of course, you guessed it we celebrated once again with a well deserved dram. It was the best Whisky of the day. Over the two days on the River we had witnessed many fisherman, a few leaping salmon, baby sharks (nope that was salmon with their fins sticking out), heron, osprey, more fisherman, courage and determination. After a very comfortable, relaxing drive back to Kingussie we all checked into The Cross Restaurant and Hotel. It had been a long day, we had spent more than 7 hours in our canoes making our way to the open sea, we were all very keen to get warm, comfortable and fed, and once again our accommodation and dinner were 5 star. It was for sure a trip for the pampered thrill seeker, with outdoor adverture during the day and luxury by night. The Cross didn’t disappoint, Elaine the owner made us all feel welcome and showed us directly to our rooms where we took a little time unwinding and getting organised for the evening. We enjoyed local Ales, fine wines, home smoked cod, delicious pavlova and of course a few drams before bed. Recapping on this right now I feel exhausted, how did I do all of this in just 2 and half days, how did I get over my fears and get on that River, how did I manage to ENJOY it, and in fact want to do it again. Maybe I have changed, maybe I am now a pampered thrill seeker. 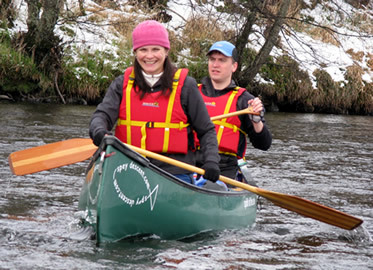 All I know is I had a blast, the Whisky adventure down the Spey was amazing, and more… This is a must do trip for any and all levels of paddler, if I can do it and enjoy it anyone can. Go for it, you have no idea what you are missing!! !